Home » awesome duuuuuuude , dungeons and dragons , education » These middle school girls play Dungeons & Dragons... and it is amazing! These middle school girls play Dungeons & Dragons... and it is amazing! Don't you wish YOU had a teacher like Ethan Schoonover when you were in middle school? This is the kind of innovation and creativity that educators should aspire to have in their own classrooms. Heck, it's enough to tempt me to consider teaching full-time. Several years ago I taught an elective about making and managing websites at an Episcopal day school. It was just one class three days a week, but it was so much fun and I still think often of those kids and the imaginations they were putting to use. The girls that Schoonover teaches are indeed blessed to have a mentor like "Mr. E" because they are cultivating skills that will take them very far in life. What are we discussing here? After pestering Mr. Schoonover with the idea for an official after-school group at Lake Washington Girls Middle School located in Seattle, the ladies began a Dungeons & Dragons Club. Seems that they had been inspired by the hit Netflix series Stranger Things and how the kids on that show take so much pleasure from their marathon sessions of Dungeons & Dragons. The club became such a raging success that Schoonover was approached about making an entire elective class of the classic role-playing game. There are now two groups of girls involved in DND campaigns and Schoonover is planning a summer program focused on the game. 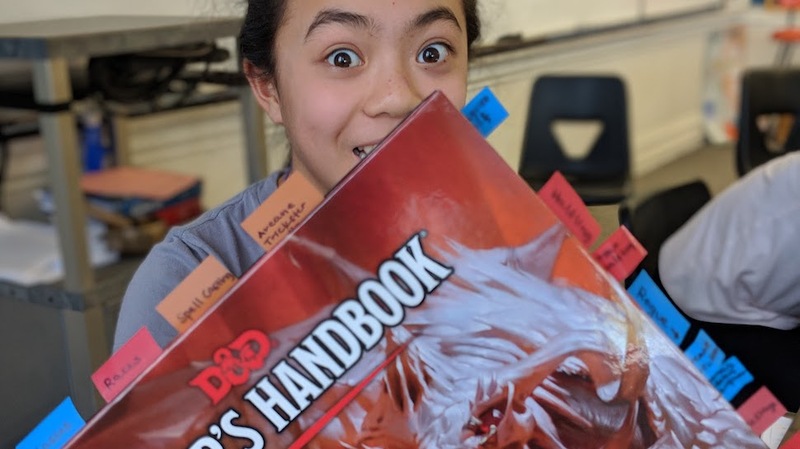 The Dungeons & Dragons Club has become a pillar of social involvement at Lake Washington Girls Middle, and even students who aren't in the class are asking for updates on how the adventures are going. And after he began posting photos and updates on his Twitter feed Schoonover and his students are now actively followed by fans around the world: young people but also teachers who have been inspired by this fresh approach to education. 'Cuz it's not just about the game itself. Schoonover is using it to teach concepts like math (calculating the volume of a room before confronting that weird mist within) and ecology and political science, as well as social interaction skills. The girls are compelled to tap into their knowledge and find ways to apply them to "real world" (kinda) problems. Eschewing the standard modifier tables and instead uses algebra to solve dice rolls, "inspiration points" are rewarded for success. Stuff like that is what merited a visit from some of the game's designers at Wizards Of The Coast. Forget the gold pieces ladies: you and your teacher have scored a mound of platinum These are girls who would probably conquer "Tomb Of Horrors" on their first try. Formidable indeed! Geek & Sundry has a TERRIFIC article about the adventures at Lake Washington Girls Middle School. Here's hoping that it will lead to even more students and teachers beginning their own Dungeons & Dragons clubs. One of the biggest obstacles that educators face in American public schools especially is "teaching a test" instead of teaching the material for its own sake and to encourage critical thinking skills. Schoonover and his crew have found a way to overcome that obstacle... and how perfectly fitting that they have! One suggestion though: Mr E and his girls should begin an official blog or a Facebook group about their campaigns. And use it to reach an even wider audience. Not just that but the students can chronicle their exploits with art, maps etc. So there would be even more skills being nurtured: drawing and painting, cartography, and online publishing practices and ethics. Anyhoo, just an idea. Speaking of this game, a few weeks ago I posted about my own first time playing Dungeons & Dragons. And how that had been such an enjoyable and creative experience. Don't know why I did it at the time but months before Tammy the Pup (my miniature dachshund) and I set out across America (two years ago!) 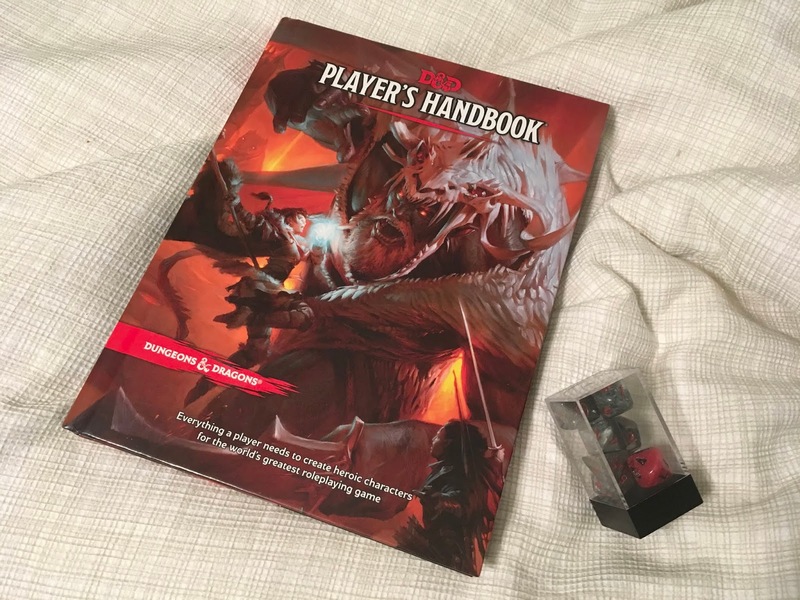 I bought a copy of the Fifth Edition Dungeons & Dragons Player's Handbook. Maybe it was divine Providence telling me that it would be needed eventually? Anyhoo, the core guide is in my possession and as you can see in the photo I've a set of those weird dice. Since it looks that I'll be getting settled now in [location redacted] I'm gonna find or try to start a group here. My therapist has strongly suggested that it may help with my bipolar disorder and how often it erects blocks in my writing. That might deserve keeping a chronicle of for its own sake, researcher and reporter that I try to be. Gary Gygax, wherever ye be, we raise a flagon of mead high in your honor. You have awarded a boon to young people and may they forever journey far with it! Hey Chris. I've always loved seeing what you're up to and welcome back. What a great idea! I have taught a creative writing class middle school elective for ten years and these girls and their teacher playing DND is brilliant. I may try this in our own classroom.